Dr. Henry Howard Holmes came into this world as Herman Webster Mudgett May 16, 1861 in Galmanton, New Hampshire. His family was affluent, and the intelligent young Herman had the means to attend medical school at the University of Michigan. It was there that he began his lucrative career as a con artist, using cadavers from the medical school to collect on fraudulent life insurance claims. When he graduated in 1884, he shed his old name for the new moniker of Dr. Henry Howard Holmes. He relocated to Chicago supposedly to seek employment as a pharmacist. He planned to do double duty committing insurance fraud, as multi-tasking had paid off so well in Michigan. Holmes took a job working at Dr. E. S. Holton’s drugstore. A few years later, he took over the business. The circumstances surrounding this takeover are unclear. Most accounts claim that the previous owner, Dr. Elizabeth S. Holton, mysteriously “disappeared,” at which point Holmes took over the pharmacy. Others claim her husband was the doctor and had died of cancer prompting her to sell, which is very clearly not correct. There is significant evidence that Dr. Holton simply got pregnant and decided to sell her business, including a record showing that Holton’s daughter was born in 1887, and there are records of Dr. Holton being in the area until 1910, well after Holmes himself had died. Whatever the case, after taking over the business, in the empty lot across the street, Holmes designed and ordered the construction of an enormous three-story building known around the area as “The Castle”. He made certain that none of the contractors worked on the project long enough to have knowledge of its complete lay-out. The building was an intricate, bizarre maze of false floors, sliding doors, airtight and soundproof rooms, trapdoors, and stairways leading to nowhere. Some of the rooms contained gas jets, and there were chutes leading to the basement. His house of horrors was ready for operation against the backdrop of 1893 World’s Columbian Exhibition in Chicago. He opened the Castle as a hotel for people in town visiting the fair. He also used it as a stable for the many women he would hire for work and/or seduce, propose marriage to, swindle, and most often murder. Before murdering them, he would take out life insurance policies on them, sometimes as a condition of employment. He, of course, would pay the premiums—with the condition that he was named a beneficiary. In addition to collecting the insurance money, Holmes would sometimes sell their bodies, or just the skeletons and some of the organs, to medical schools. Holmes had his choice how he would torture and kill his victims. Some he would gas as they slept in their rooms. Others he trapped in an air-tight bank vault near his living quarters until they suffocated. The corpses would be dropped down a chute to the basement where the remains would be disposed of in a kiln, or the bodies dissected with parts sold to medical schools. There were also instruments of torture in his little basement lab, implying that perhaps not all those who found their way into the basement were dead at the time. After the Exhibition was over, the good doctor left Chicago and took his con-man racket on the road. Holmes and his long time partner-in-fraud Benjamin Pitezel decided to fake Pitezel’s death for the insurance money. All Holmes had to do was produce a charred corpse and claim it was poor Pitezel, the victim of an unfortunate laboratory accident. But Holmes changed his mind and set fire to the real Pitezel instead after get him nice and drunk. He collected on the policy, but when he didn’t pay out to a third person who knew about the plot – a convict named Marion Hedgepeth – he blew the whistle on Holmes. The cops started a manhunt. They got their man in Boston in November 1894, but unfortunately it was too late to save three of the five Pitezel children that had been left in Holmes’ care while Pitezel’s wife traveled to Canada with the other two. Sometimes after the children were left in his care, he killed them. Holmes was first charged with insurance fraud, but later charges were added for the murder of Benjamin Pitezel. During his time in custody, Holmes admitted to killing as many as 27 people though evidence suggests the number may have surpass 200. The verdict was guilty, and the defendant was sentenced to hang at Moyamensing Prison in Philadelphia on May 7, 1896. 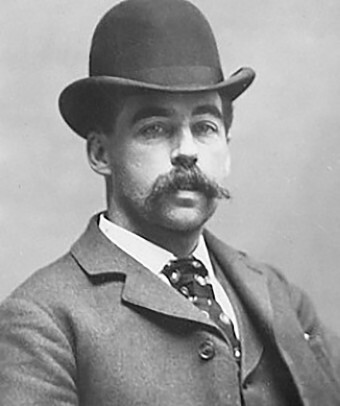 With all the media attention, Holmes was also able to make quite a lot of cash off his imprisonment when the Hearst Corporation paid him some amount of money (the exact amount is disputed, but somewhere between $7,000-$10,000, or around $183,000-$261,000 today) for a full confession from him. In the end, though, no amount of money could save Holmes from his date with a noose. He was reportedly incredibly calm and self-possessed as he faced death. Prison officials said he slept soundly the night before and had to be called twice in the morning to wake him to prepare for his execution. After eating a full breakfast, he conversed pleasantly with all present right up until the time he was standing over the trap door on the gallows. He took the opportunity to profess his innocence in the killing of the Pitezel family. He remarked, “Take your time; don’t bungle it,” to an assistant superintendent who seemed to be acting in haste out of nervousness. When asked “Are you ready?” He replied “Yes, good-bye.” Then the executioner sprung the trap. He was pronounced dead 15 minutes later. Holmes had only one last request. He wanted his coffin filled with concrete before being closed, and his grave to also be enclosed in concrete so that his own corpse wouldn’t be desecrated. His wish was granted.